To give you an idea of the terrain, the remote nature of this part of the country, and the dozens of National Parks, Wilderness Areas, Tribal Parks, State Parks, National Forests, Lakes and Recreation Areas that surround the Grand Canyon, use this map. Get the basic lay of the land around the Grand Canyon with our map showing cities surrounding Grand Canyon National Park, radiating out in concentric circles, with distances noted. The South Rim is the most visited rim at the Grand Canyon. The South Rim is open 24 hours a day, 365 days a year including all holidays, and has hotel and lodging options both inside the National Park as well as around in nearby towns. Also available year-round are most visitor services such as camping, lodging, and restaurants. Camping and hotel reservations are strongly recommended during spring, summer and fall. The North Rim is a very remote destination so there is limited lodging and services, plus the short summer-only season means it sells out quickly. The jewel of the North Rim, perched on the precipice of the Kaibab Plateau, is the dignified Grand Canyon Lodge - a charming mix of motel and cabin accommodations and the only lodging inside the National Park. Just 5 miles outside of the park, the Kaibab Lodge is nestled on the Plateau amid a stand of Ponderosa pine. In nearby Jacob Lake, a scenic 44 miles from the North Rim, lies the Jacob Lake Inn. If you prefer a night-sky canopy and the smell of pine over Grand Canyon North Rim hotels and lodging, be sure to check out North Rim RV camp sites and campgrounds; one campground is inside the Park, while several others lie just beyond. At the North Rim, a moderate budget should secure you a room at the Grand Canyon Lodge inside the Park; rates range from $124 for a motel room to $173 for a cabin. Visitors to the North Rim can't realistically do it in just one day, so we encourage you to book at least one overnight; even better, increase your length of stay to at least two nights and plan to stay at the rim or in Page, Fredonia or southern Utah. 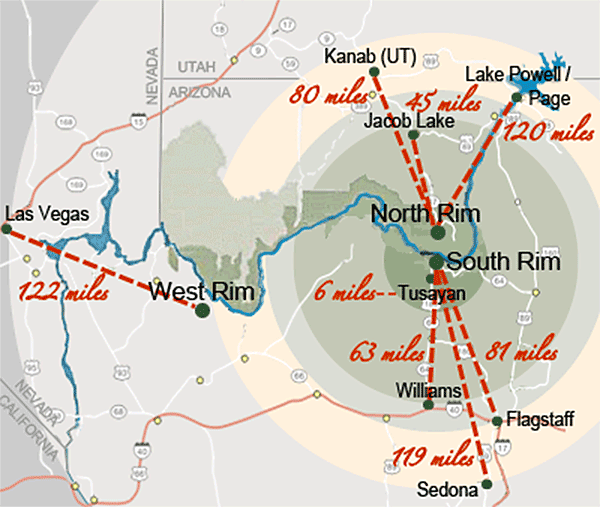 Many maps of the West Rim pinpoint Peach Springs, AZ as the destination, but if you want to go to the Grand Canyon Skywalk at Grand Canyon West, you'll want to use our map of Grand Canyon West. We've also highlighted for you locations of the surrounding lodging and points of interest.